This past New Year's Eve, we had planned on making stuffed scallops as an appetizer but with all the other food we had, the scallops appetizers never came out of the kitchen. When my husband brought it up a few weeks ago, it inspired me to make it for him since it was a dish he was looking forward to. 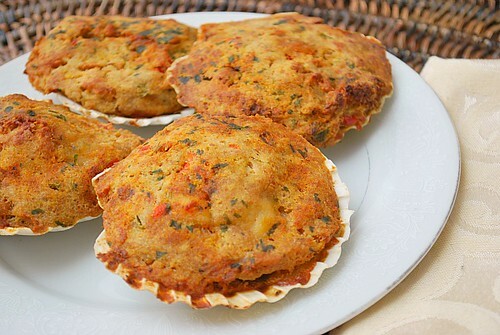 Making these Stuffed Scallops were pretty easy and the filling reminded me of crabcakes. The filling took no time to make and you could prepare these in advance and freeze before baking. They make a great appetizer or a few could easily make a meal. Lastly, if you're not sure where to get scallop shells, try asking your local fish monger or seafood person at your local market. Melt the butter in a large frying pan over medium heat, add diced onion and bell pepper and sauté until transparent. Add the wine and Worcestershire sauce and mix well. Stir in bread crumbs and herbs and brown the mixture, adding more wine if necessary to get a stuffing like consistency. Combine the scallops with the stuffing. Fill the scallop shells with the mixture. After the scallop shells are stuffed, place in 375°F oven for about 8-10 minutes or until golden brown. Serve warm as an appetizer or as an entree. These look so good!! I've been dying for scallops. I typically go for the big broiled ones too.. but those look amazing!! The shells remind me of when I was a kid in Nova Scotia seeing the scallops boats come in! Can I make these in the morning for later that day, should I cook and then reheat later, or stuff and refrigerate, then cook later?